The Women of the DC Universe: Series 1: Hawkgirl Bust is available on Amazon! Hawkgirl first appeared in DC Comics in All-Star Comics #5 (1940), making her the first DC costumed superheroine. 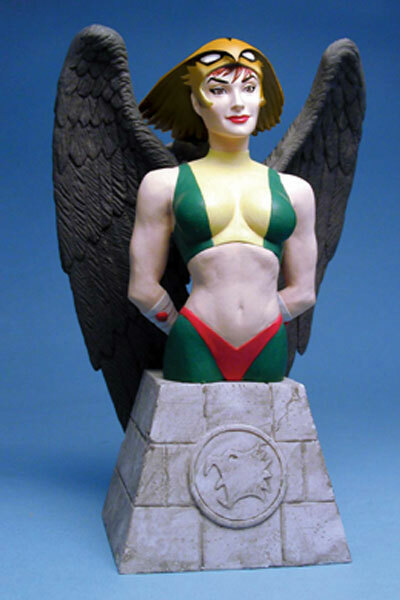 There have been many alter egos who have worn the costume of Hawkgirl (Shiera Sanders Hall, Shayera Hol, Kendra Saunders) and this statue represents them all. The Hawkgirl character has been a member of both the Justice Society and Justice League. This bust is 5.75″ tall. It is designed by Adam Hughes and sculpted by John G. Mathews. Soar over to Amazon and acquire The Women of DC Universe: Series 1: Hawkgirl Bust today!